Video: Rise Above Cape Town! The team behind Two Wheels Across, a full service production house based in the UAE, recently spent 6 weeks in Cape Town to film an aerial portrait of the Mother City. Sit back, put your headphones on, switch to full screen and enjoy the beauty of Cape Town summed up in a 2:37 minute video! Kudos Two Wheels Across! British Airways to reduce flights between London <> Cape Town! The flag carrier airline of the United Kingdom, British Airways, will reduce its weekly service between London's Heathrow Airport (LHR) and Cape Town International Airport (CPT) in Cape Town by two flights during the South African winter season (from 27 March 2016) due to commercial reason. The airline will cancel its flight BA045 between London <> Cape Town on Thursdays and Saturdays, while the return flight between Cape Town <> London (BA044) will be cancelled on Fridays and Sundays. Affected customers will be re-accommodated onto flights BA059 and BA058 on the same day. MRI Botswana opens a new state of the art polyclinic in Kazungula/Kasane! MRI Botswana, an emergency medical transportation company in Botswana, has opened a new state of the art medical facility in Kazungula's Borogo Junction Mall on 22 September 2015. The services of the clinic, which is running under the newly established brand name Prime Health, are ranging from a GP Practice (Prime Health Medical), a Pharmacy (Prime Health) and Emergency Medical Services (EMS). All services are offered by a team of qualified paramedics supported by EMS-trained doctors and nurses. Kazungula is located in the far north of Botswana, about 10 km east of Kasane. 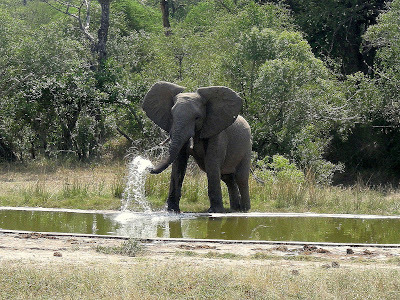 Mozambique: Peace Parks Foundation to develop Zinave National Park! The Peace Parks Foundation and the Mozambican Minister of Land, Environmental and Rural Development, Mr Celso Correia, have signed a co-management agreement in order to develop Zinave National Park in Mozambique over the next five years. Zinave National Park will be developed as an integral component of the Great Limpopo Transfrontier Conservation Area (TFCA), the larger area surrounding the core transfrontier park. Zinave National Park, situated in the district of Mambone near the Save river in Mozambique's province Inhambane, created by decree on 26 June 1973 and currently covers 4,000km². The Park has very diverse tree species, inlcuding the Acacia nigrescens-dominated plant community, as well as dry Terminalia woodland in a scenic landscape. It boasts massive trees and has a very high carrying capacity for wildlife. Chakalaka is one of the most uniquely South African dishes. The usually spicy vegetable relish is popular all over South Africa and comes in many variations (see Jodi-Ann Pearton's version or KitchenCOZA's version) depending on region and, of course, family traditions. Most Chakalaka versions include onions, garlic, chillies, curry (power or paste), tomatoes and beans. It is traditionally served with meat, pap, bread or stews. Capetonian chef Funi presents his version in the video below. Enjoy! Kudos Funi! To get the recipe for Funi's Chakalaka click here! travelnewsnamibia.com, the latest addition to the Venture Publications pool of products aimed at promoting Namibia to the world, has produced its very own image film of Namibia. "This is Namibia" highlights all of Namibia's beauty - the open spaces, the undiscovered landscapes, the unspoiled nature, the friendly welcoming people, the abundance of wildlife, the mesmerising scenery - in just 140 seconds! Enjoy the video, experience Namibia! Kudos travelnewsnamibia.com! East Africa: New road between Uganda and Rwanda! Great news for all travellers planning to visit Uganda and Rwanda by car. A new roadlink from Uganda (Kabale) via Gatuna into Rwanda has been officially opened to traffic. The newly-upgraded section of the road is about 80km long and eases road transport from the tourism hub of Kabale into Rwanda. Costruction of a second axis to and from Ugandan border post of Mirama Hill, where only recently a one stop centre, housing customs of both Uganda and Rwanda, immigration, and security officials, has been inaugurated, is also underway. Kenya: Street View now lets you explore the Samburu National Reserve! Google has - in partnership with Save the Elephants and with the support of the Samburu County Government - released Street View imagery of the Samburu National Reserve, Lewa Wildlife Conservancy and the David Sheldrick Wildlife Trust. Enjoy! New museum to open in Cape Town! A new museum was launched in Cape Town on 01 September 2015. The Cape Town Museum, which is located in the old Standard Bank building in Adderley Street, is a state of the art heritage institution that will provide innovative ways for local residents and tourists to interact with the collection. The museum will be hosting permanent exhibitions on the history and development of Cape Town from the earliest times as well as exhibitions on contemporary Cape Town and on the Cape Town of the future. The official opening of the Cape Town Museum will be announced in the near future. We'll keep you posted! flyafrica (Namibia) to resume flighs between Windhoek <> Johannesburg! flyafrica.com (Namibia) resumes its service between Windhoek and Johannesburg today (14 September 2015). The airline now operates flights between Hosea Kutako International Airport (WDH) in Windhoek and Lanseria International Airport (HLA) in Johannesburg. A decision by Namibia's High Court required flyafrica.com (Namibia) to move operations from OR Tambo International Airport (JNB) to the privately owned international airport that is situated north of Randburg and Sandton to the north west of Johannesburg. flyafrica.com (Namibia) will initially operate three weekly flights between the two destinations on Monday, Wednesday and Friday with the airline committing to daily flights before November 2015. To avoid any disruption to their passengers, flyafrica.com (Namibia) is offering a unique Sandton connection bus service. Passengers will be able to board a bus at the Sandton Gautrain station and go direct to Lanseria International Airport (HLA). South Africa: Homo Naledi to be on limited display at the Maropeng Visitor Centre! A new human species, named homo naledi, has been revealed at the Cradle of Humankind World Heritage Site in Gauteng on 10 September 2015. Consisting of more than 1,550 numbered fossil elements, the discovery is the single largest fossil hominin find yet made on the African continent. A selection of the newly discovered homo naledi fossils will be on display at Maropeng, the official visitors' centre of the Cradle of Humankind World Heritage Site, until 11 October 2015 18 October 2015. Tickets to Maropeng will be discounted by 25% during that time. The Maropeng Visitor Centre, located about 60km from Johannesburg, is open daily from 09:00 until 17:00. It can be found just off the R563 Hekpoort Road in Sterkfontein. Barry Lewis, a Brit running the cooking web show "My Virgin Kitchen" on youtube.com, recently did a show fully dedicated to treats from Zimbabwe. All the treats were send to him by his friend Rob, who seems originally from Zimbabwe and recently spend a holiday there. Besides dried Mopane worms (see video #2 in the playlist) and Chakalaka from Rhodes, Barry tastes Marie bisquits from Lobels, Korn Kurls from Willards, a bis-kit bar, Apricots from Baxtons and a few more typical Zimbabwean treats. Enjoy! Namibia's High Court in Windhoek on Friday (04 Sept 2015) ruled that flyafrica.com (Namibia) has not been licensed to operate in the country. The court ruled that the low budget carrier does not have the valid licence to fly passengers between Hosea Kutako International Airport (WDH) in Windhoek and OR Tambo International Airport (JNB) in Johannesburg, South Africa. 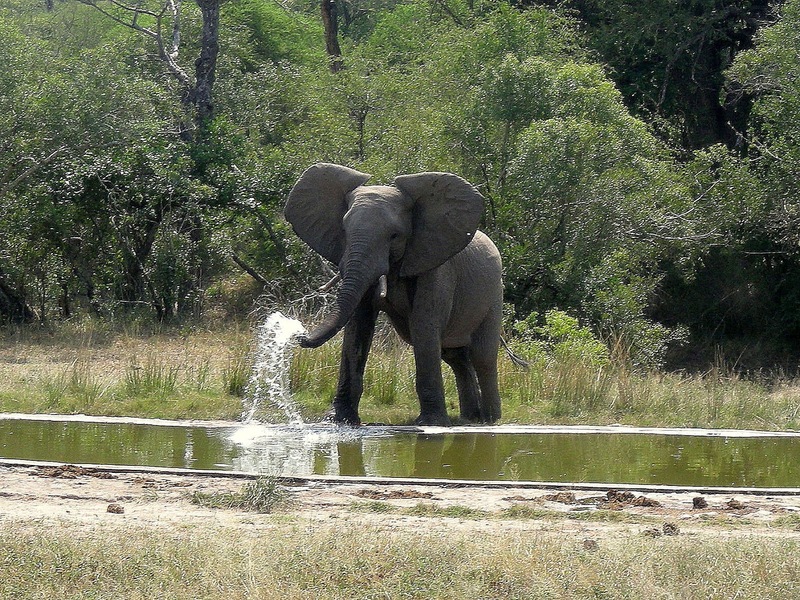 Zimbabwe: Elephant numbers in the Zambezi Valley drop by 75%! According to the latest findings of the Africa-wide Great Elephant Census, which surveyed all major elephant populations in Africa in 2014, Zimbabwe's elephants in the Zambezi Valley have declined dramatically. There has been a 75% decline in the numbers of elephants in the Zambezi Valley south of Lake Kariba (Sebungwe area) since 2001 and a a 40% decline in elephant numbers in the Middle Zambezi Valley, near Mana Pools. The numbers of elephants in the Sebungwe area decreased from 14,000 (2001) to 3,500 (2014) while elephant numbers in the Middle Zambezi Valley, including Mana Pools, decreased from 18,000 (2001) to 11,500 (2014). A recent census in Mozambique revealed that the country has lost around 50% of its elephants between 2009 (20,000) and 2014 (10,300), while Tanzania even lost 60% in the same period from 109,051 in 2009 to 43,330 in 2014. The Southern Africa Regional Climate Outlook Forum has isuued the annual outlook for the 2015/2016 rainfall season (October - March) in the Southern African Development Community (SADC) region. The period, October to March, is the main rainfall season over most of southern Africa. Owing to the differences and evolution patterns in the predominant rainfall-bearing systems, the rainy season over the region has been subdivided into four overlapping three-month periods. The countries covered by the outlook include all SADC member states (Angola, Botswana, Democratic Republic of Congo, Lesotho, Madagascar, Malawi, Mauritius, Mozambique, Namibia, Seychelles, South Africa, Swaziland, Tanzania, Zambia and Zimbabwe). Durban to host the 2022 Commonwealth Games! Durban in South Africa was awarded the rights to host the 2022 Commonwealth Games at the Commonwealth Games Federation (CGF) General Assembly meeting in Auckland (New Zealand) on 02 September 2015. The coastal city was the only bidder for the multi-sports event after Edmonton (Canada) withdrew from contention in February 2015. The 2022 Commonwealth Games will begin on 18 July 2022 (Nelson Mandela's 104th birthday) and finish on 30 July 2022. Durban is the first African city to be awarded the four-yearly multi-sports event. Congrats Durban! The Commonwealth Games is an international, multi-sport event involving athletes from the Commonwealth of Nations. The event was first held in 1930 and has taken place every four years since then (except for 1942 & 1946 due to WWII). The Commonwealth Games was last held in 2014 in Glasgow (Scotland), with the Gold Coast (Australia) hosting the 2018 event. Airports Company South Africa (ACSA) has published the on-time performance results of domestic airlines’ flying out of OR Tambo in Johannesburg, Cape Town International Airport, and Durban's King Shaka International Airport in August 2015. The City of Cape Town has issued a warning to all beach and ocean users to be wary of an increased in-shore shark activity over the spring and summer months. Typically, shark sightings start in late August, and continue through to April, with most sightings being reported in mid-summer. Surfers are asked to be especially vigilant in the stretch between Sunrise and Macassar Beaches during the spring and summer months, as research has shown that the shark presence in these waters increases at this time of year. The Shark Spotters Information Centre at Muizenberg Surfer's Corner is open to the public from 08:00 to 18:00 seven days a week. The Shark Spotters Information Centre provides up-to-date information on sharks and marine ecology, basic first-aid, general public assistance and emergencies, storage of valuables and lost property. The Fish Hoek shark exclusion net will again be deployed for the annual Fish Hoek Spring Splash on 6 September 2015. The Fish Hoek shark exclusion net will be in full operation during the 2015/2016 summer season. On days that the Fish Hoek shark exclusion net is deployed, the operating hours will be from 09:00 to 17:00 and may occasionally be extended to allow for lifesaving training or events. The Shark Spotters will keep beach users informed about the deployment of the Fish Hoek shark exclusion net via Twitter and Facebook, and signage is displayed when the net is deployed. November 2015 - March 2016 > The net will operate on a daily basis, depending on the weather. Weekends, public holidays and school holidays will be prioritised. The Fish Hoek shark exclusion net will not be deployed if weather conditions (wind and swell) are deemed to be unsuitable; this will be assessed on a daily basis. If weather conditions deteriorate over the course of a day when the net is already deployed, the net may be removed as a precautionary measure. Additionally, if there is a high presence of whales or other marine mammals in the area, the Fish Hoek shark exclusion net will not be deployed.